Recently, I sat down to write an article about some of the divisive, hot-button topics that dog the tarantula hobby and often ensnare uninitiated keepers in heated debates. These are subjects that new hobbyists are often interested in learning about, but an internet search or an innocent forum query produces two equally heated and opposing answers. My hope with this feature is to present both sides of these gray-area arguments so that keepers can develop their own informed opinions and make equally informed decisions. For the second installment, I’ve decided to tackle the “explosive” topic of tarantula handling. I’ve mentioned many times in various posts and videos that when I bought my first tarantula 20 years ago, it was partially to get over my fear of spiders. I had arachnophobia since I could remember, and I was hoping that by keeping, observing, and eventually handling my new G. porteri, I could overcome what I perceived to be an irrational and embarrassing fear. I thought that by holding this animal without freaking out, I would prove to myself that I had finally overcome my phobia. However, my fear of these animals, however ridiculous, proved a bit more difficult to conquer. After keeping this tarantula for about six years, my first attempt at handling her almost resulted in a bite (and in me passing out) as she attacked the brush I was trying to prod her with. Although I had read for years that “rosies” were a gentle species that enjoyed being handled, my inexperience with testing temperament coupled with my specimen’s excellent feeding response nearly resulted in both of us getting injured. After all, my reflex would have been to pull my hand away, likely launching my pet into the air and to her death. So, for years I endured ribbing from friends and family who couldn’t understand why I kept an animal that I was afraid to handle. After all, wasn’t the point of keeping tarantulas to hold them? It wasn’t until years later that I learned that the answer to this question is an emphatic NO. When I got serious into the hobby, I was actually surprised to discover the topic of handling was such a hot-button issue. I just assumed everyone held their tarantulas and that it was a big part of the hobby. However, after reading several message board debates on this topic, I soon learned that many saw handling as an outdated remnant of the hobby’s beginnings when the market was filled with mostly docile New World species. Many “serious” hobbyist were vehemently against this practice, labeling those who chose hands-on interactions with their pets as irresponsible and reckless. There was talk about stressing the animals, putting the keeper and animal at risk, and even more frightening, possibly putting the very hobby at risk if a bad bite should make it to the news. They argued that tarantulas should be treated the same way one might approach keeping tropical fish; you can look, but don’t touch. Instead of folks being ridiculed for not having the courage to handle a big, hairy spider, people were being admonished for handling their animals. Of course, not all agreed with this sentiment. There were those on the other side of the proverbial fence, seasoned keepers and newbies alike, who thought that this alarmist attitude was ridiculous. Many have reported years of handling experience without incident, and some ridicule the hobbyists who label the practice as potentially hobby-killing. These folks argue that, if done responsibly and intelligently, handling can harmless habit that only enhances a keeper’s enjoyment of his or her pets. So, which side is correct? Should it be up to the keeper as to whether or not to engage in this seemingly harmless practice, or are those against it correct in labeling handling as a selfish, dangerous habit that puts the hobby at risk? As always, the answer is likely somewhere in the middle. Below are the arguments and counter arguments and how they usually break down. For clarity, stances supporting tarantula handling will be in GREEN; stances against will be in RED. Handling is an archaic, outdated practice from a period when only docile New World’s were being kept. Those against handling are very quick to point out that when the hobby first began, the majority of the species available to the pet trade were docile New World’s like the G. rosea and the B. smithi. Although these species are able to bite, their venom is quite mild to humans, and the discomfort has been likened to a bee sting. Those who received a bite would likely only suffer from an hour or so of localized pain and would be no worse for wear the next day. It’s also important to remember that these giant hairy spiders were a bit of an exotic novelty back then, and very little was known about their temperaments and behavior. Many people treated them in the same way they would a gerbil, hamster, or other small, furry mammal. In short, folks back then really didn’t know any better. Today, the hobby has changed drastically. No longer are the only tarantulas available relatively docile Grammastola and Brachypelma species. The hobby is now filled with larger, more aggressive New World tropical genera like Phormictopus and Pamphobeteus, as well as a plethora of Old World species. Many argue that the majority of the hundreds of species now available on the market are not appropriate for handling. Folks who are not aware of the temperament and venom potency differences between species could be setting themselves up for a world of hurt if they try to get some hands-on time with a large tropical or an ornery Old World. The majority of species now kept in the hobby should probably not be handled due to temperament and/or venom potency, and the ones that are tractable get nothing from it. Handling has no purpose in the hobby and serves only to put the keeper and the animal in unnecessary danger. Handling has been practiced for decades without major incident. Sometimes when debating an issue, it’s best to look at it in a historical context. Since the beginnings of the hobby in the 1970s, folks have handled their spiders, and not once has a bite made it to national news to threaten the hobby. Even when the hobby exploded in the ’90s, with many new species being offered at pet stores and exotic pet expos, you never heard stories of unsuspecting keepers being ravaged by their animals. The fact is, many of those who keep tarantulas consider them pets. As such, it is quite natural that they should want to interact with them as closely as possible and, in some ways, show them physical affection by handling them. Although the alarmists may want to paint handling as a reckless and dangerous habit, it’s a common and age-old practice that has yet to lead to any hobby-threatening tragedies. Handling of a G. rosea. Thanks to my friend, C.J. Peter for permission to use his photo! In truth, tarantulas have been kept for decades, and in that time, many folks have handled without incident. Even as the number of species available in the hobby has swelled to hundreds and the number of people keeping these giant spiders has exploded, there’s yet to be a death or major incident reported. For those who keep and love these animals, handling can be a very natural an integral part of the hobby. To insinuate that someone who holds their T is being irresponsible is just silly. Handling tarantulas causes them unnecessary stress and puts them at risk. In the wild, if a large animal suddenly grabs up a tarantula, that unfortunate spider is probably about to be made a meal. Tarantulas often live in hostile environments where they can be predated on by larger animals, including human beings. Anyone who has seen a startled T display the posture where it pulls all of its knees up over it body knows that they can, in the very least, experience stress. Although some spiders seem to cotton to handling, it must be jarring for them to be on substrate one minute then prodded onto a giant human hand another. Some can respond by hunkering down, sprinting away, or kicking hairs in defense; all behaviors that point to an unhappy spider. This can lead to escapes, a bite, or an injured or dead tarantula if it should fall. Folks in this camp believe that part of the responsibility of keeping these giant arachnids is to provide them with a safe, comfortable, stress-free environment. Handling only causes them unnecessary stress and risks triggering their survival instincts. It also increases the risk of escapes or injury from a fall or mishap. If done correctly, handling causes no stress to the animal. Those who handle will often concede that just sticking your hand in and scooping up your pet is not the best way to go about it. When handling, it’s important to check your spider’s mood and temperament before putting your hand in, often by touching the back leg with something like the soft tip of a paintbrush. If the spider reacts favorable (or doesn’t react much at all) it is probably game for a bit of hands-on action. If it attacks the brush or kicks hair, you forgo handling, therefore sparing the tarantula unnecessary stress and yourself from a bite or a handful of hairs. It’s important to remember that these are animals that can be shipped cross-country in unfavorable climate conditions and emerge from their packages active and ready to eat. They have proven to be very capable of dealing with and bouncing back from stress. Some folks who engage in this practice also express the belief that many tarantulas can become more comfortable with, and even enjoy, a keeper’s touch with with regular and systematic handling. Others even believe that tarantulas can learn to “trust” their keepers as long as a regular handling regiment is followed. As evidence, they are happy to share videos of them handling and petting their eight-legged friends, who seem perfectly relaxed. To these hobbyists, the idea of not handling your pet spiders is ridiculous, and those who decry it as harmful or reckless are equally as ridiculous. However, not so fast…the thought of tarantulas enjoying close human contact is just absurd. Many who keep these amazing animals are certain that they are not hardwired to recognize and appreciate physical acts of affection, and they certainly can’t be trained or expected to learn new tricks. These are animals that don’t rely on intelligence or emotion, but instead operate on pure instinct. They definitely didn’t survive millions of years by cozying up to larger creatures for affection. This means that although you may enjoy holding your animal and stroking its abdomen or carapace, at the most your spider will be indifferent. It certainly isn’t going to enjoy the attention or reciprocate like your family dog might under the same circumstances. People on this side feel that if a spider allows you to handle it without incident, it doesn’t mean that it enjoys the interaction; no, it’s more likely that it is tolerating it. They are not a domestic animal like a dog or cat that has been evolved to adapt to close human interaction. They are wild animals that have existed and survived on hardwired primal instinct for millions of years. To these hobbyists, the mere suggestion that these arachnids could get any benefit from handling is simply ludicrous. Some specimens are just really tame and tractable, so there’s no harm in handling them. There are many species of tarantulas that are recognized for having very docile temperaments and being okay for handling. If a keeper has a spider that she’s kept for a long period of time, observed its behavior, tested its temperament and handled in the past, what is the harm in it? Many folks, especially ones who use some of their spiders for demonstrations, have particular specimens that they handle frequently and without incident. It’s all about knowing your animals and recognizing their personalities. These are wild animals and, as such, can be unpredictable. Some would say that tarantulas can be tame … until suddenly, they aren’t. There are plenty of stories out there from keepers who used to hold a particular specimen until it bolted or attacked, seemingly without warning. Sure, a tarantula may allow its keeper to handle it for a period of time, but all that means is that in those instances, it was tolerating the behavior. Have you ever accidentally blown on a T and seen its reaction? It doesn’t take much—an errant breath, a draft from a window, a slight jostle—to send a calm specimen into a frantic state. This makes them VERY unpredictable. There are also many stories of once docile Ts molting into nasty little monsters (and sometimes molting back to docile again). Their temperaments are NOT always predictable or consistent, and many will change as they age. Ts that tolerate handling one day could easily freak out the next. Even if one were to get bit, no one has ever died from a tarantula bite, so the risk is minimal. Well, at least from a tarantula’s venom. Although there have been two cases in which a person has died from complications from a tarantula bite, both due to secondary infection, their venom is not lethal. The fact is, these aren’t venomous snakes or an animal that could kill you. A bite from one of these animals, particularly an Old World species, will lead to quite a bit of pain and discomfort, but there is no antivenin or hospital visit needed. Just a cursory look at the bite reports on Arachnoboards makes it very apparent anyone bitten walks away from the unpleasant experience. Those in this camp often complain that folks who describe them as potentially dangerous animals are grossly exaggerating. Although not lethal, a bite can be debilitating … and could lead to a hobby ban. Now, obviously we’re talking about Old World bites here, and most people that choose to handle do so with more docile (and less potent) New World species. However, although most folks know better than to try to handle Old World tarantulas, a quick search on YouTube will reveal dozens of keepers who throw common sense to the wind to showoff their handling skills with these animal. These videos often have thousands of views and dozens of likes, and one can only assume that they could inspire copycats. Worse still, many new to the hobby don’t understand what differentiates New World and Old Word tarantulas and may emulate this type of handling without any idea of the danger they are putting themselves in. Sure, a tarantula bite won’t kill you. That said, a bite from an Old World species can be much more than a simple inconvenience, and many bitten by these species end up in their local emergency rooms as they look for relief from the pain. And all it would take is one highly-publicized, sensationalized bite to make the press for folks to start asking why people are even allowed to keep venomous arachnids. It’s a fact that tarantula sales have already been banned in some countries and states for less. Tarantula keeping, although gaining popularity, is still a fringe hobby. If a legislator decides to push a ban on these “dangerous” bugs, there wouldn’t be much in the way of public opposition. Many feel that it’s hobbyist responsibility to maintain a hands-off relationship with their pets in order to minimize the chances that a bad bite could bring damaging publicity. Handling for demonstrative purposes can be educational, help people get over their fear of these animals, and bring interest to the hobby. Some who keep tarantulas will put on demonstrations at elementary schools and expos, and usually a big part of these presentations involves the keeper handling a T or allowing others to handle it. If done properly and safely, those in attendance are in no danger as they get to experience these often demonized animals up close. It’s no secret that many people are both repulsed and fascinated by the idea of a giant hairy spider, so getting to experience one up close harmlessly being handled is a good way to stimulate that interest while assuaging some of that fear. Plenty of current hobbyists will tell of the first time they saw a tarantula up close or handled one during a presentation; in many cases, this interaction served as a catalyst for their interest in the hobby. The fact is, these types of presentations offer folks a chance to see these animals as the harmless, beautiful creatures they are and often lead to more of an appreciation and interest in the hobby. The only purpose demonstration handling serves is to teach future hobbyists bad habits. For those who are against handling, these types of presentations are animal-centered freak shows that paint an inaccurate picture of what the hobby is about. If you were trying to generate an interest in the exotic fish hobby, for example, you certainly wouldn’t pass a poor fish around to be handled by dozens of gawkers. There are better ways to introduce folks to the hobby that don’t involve a practice that many hobbyists are vehemently against. Those against handling feel that people walk away from these demonstrations with the belief that handling is the norm and that all tarantulas will tolerate it. Because these are essentially wild animals with bites and urticating hairs that can make for a very unpleasant day, those being introduced to the hobby should be introduced to these animals as fascinating but deserving of respect, not as toys to be touched and played with. Handling can be useful and necessary for maintenance. I include this one on the list as I’ve personally heard a few people explain that in order to perform maintenance in the most stress-free way, it is best for the keeper to remove the tarantula from its enclosure by hand. They argue that the use of tongs and plastic cups to poke, corral, and capture the spider only causes undue stress. If a keeper handles his/her spiders and gets them use to the process, it’s better to just pick them up and move them when doing cage transfers or cleaning. For these folks, years of experience has taught them to read subtle behavioral signs and to recognize when a tarantula might be tolerant of handling, and they feel comfortable using their hands and not a plastic cup to relocate their prized pets. There is absolutely, positively NO need to pick up your tarantula for transfers and cleanings. There are many methods hobbyists use to safely transfer their pets, whether it be cupping, the bag method, or the bottle technique. Physically picking up the Ts to move them usually doesn’t come into the discussion. The vast majority of keepers would never consider using their hands for transfers. Although this may work for some of the more docile species, many collections consist of the more fast and feisty Old World tarantulas, and the general consensus is that these species should never be handled. Are you really going to pick up your OBT or Poecilotheria species to rehouse it? Besides, the logic behind a gentle cupping being more stressful than being picked up by a giant hand is suspect at best. A cup can be quickly placed over most tarantulas without them panicking, allowing the keeper to safely move his or her T anytime with minimal stress and danger to the keeper and animal. Using your hands? Not so much.. If the tarantula should bite or bolt, you could end up with an escaped or missing spider. Let me start by saying that I truly feel that this is not a black and white issue and that both sides have very valid points. Do I appreciate why both sides are so passionate about their opinions on the subject? I sure do. From a personal standpoint, I do not hold my tarantulas. Although I’ve engaged in the practice in the past, and am pleased that I can cross “handle large hairy spider” off of my bucket list, the concept of getting hands on time with my Ts quickly lost much its novelty. Although I love my spiders and think of them as pets, I also perceive them as wild animals that really get nothing from close human contact. If I want to cuddle or pet something, I have four attention-thirsty dogs ready to take one for the team. For me, it really comes down to risk vs. reward, both for me and the spider I try to hold. If I do hold my T and it goes well, I really don’t get much out of it except I can tell folks that I’ve handled a giant bug (and, admittedly, many folks would find that quite cool). And what would the spider get out of it? Absolutely nothing. At best, it tolerates its big, creepy keeper passing it back and forth between his sweaty hands for a few moments. The biggest issue for me is the safety of my animals. I know that if I get bit, my knee jerk reaction is going to be to quickly pull my hand away. This would likely result in me sending my tarantula airborne and possibly killing it. It’s a reflex that I can’t control, so no amount of preparation could ever prevent this from occurring if I were to be bitten. And, as much as I feel like I’m good at reading my tarantulas’ body language and behavior to assess their moods, I recognize that I could never be 100% sure that one wouldn’t bite me. Then there’s the fact that the majority of my collection consists of large skittish New World tropical species and Old Words, so many of my animals would be hands-off anyway. I’m always in the habit of being careful to keep my hands away from some of my defensive baboons, so it just doesn’t even cross my mind anymore to pick up any of my specimens. For me, they are there to be admired, and I feel that by not handling, I’m putting the safety of my pets first. All this said, does this mean that I look down on those who do choose to handle their pets? I’ve been around the hobby long enough and met enough folks to appreciate the draw of handling and to recognize when it’s being done responsibly. And, having been around animals my entire life, I definitely agree that, to some degree, an observant keeper who is familiar with his spider’s behavior and mood is likely at little risk of being bit. I know many folks, many who are friend from the hobby, who keep these animals and really get enjoyment out of taking them out and spending a little hands on time with them. Considering in some countries, these gorgeous creatures are hunted, cooked, and eaten, a little time spent watching TV with a careful keeper doesn’t seem all that bad in comparison. And if I’m being completely honest, I have a couple specimens that I’ve found to be so docile and, quite frankly, adorable that I am very tempted to hold them. Furthermore, although I’ve never taken my Euathlus sp. red and female B. albopilosum out specifically for handling, I may have had each in my hand more than once. Although it’s not something I would shoot a video on or encourage others to do, I certainly understand the attraction. If I didn’t have my dogs or some other cuddly domestic pet, perhaps I would feel a little different about handling. Like all things in this amazing hobby, I think that education and preparation are key. 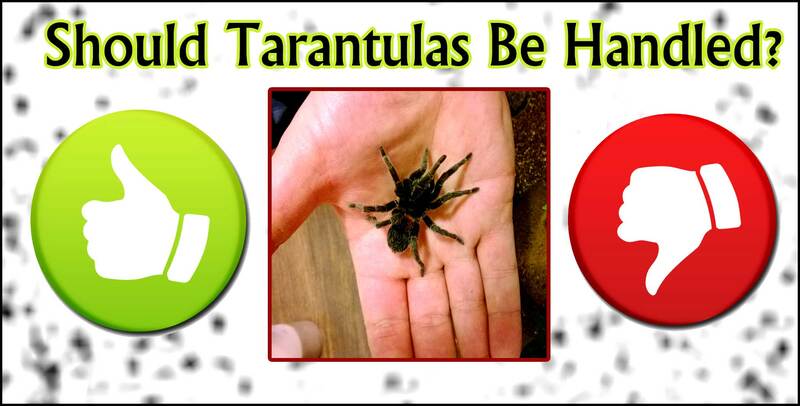 Those looking to handle their tarantulas should make sure they are aware of the risks and research the correct and safest way to go about this activity. There are plenty of videos on YouTube that demonstrate how to correctly and safely go about holding a tarantula. A keeper who makes the correct preparations and handles their spider in a responsible manner should be posing very little risk to herself, the spider, or the hobby. That said, I do think that tarantulas should be kept out of the hands of friends and family as a bite could lead to a bad situation (and likely result in a lifelong fear of Ts for the victim). The hobby, although bigger than ever, has been around for a long time. And in that time, many people have handled their pets with no serious consequences. Whether hobbyist agree on handling or not, it’s going to to continue to happen regardless of the protests and admonishments of those who see it as risky to the animals and the hobby. Regardless of which side of the fence you land on, when the topic inevitably comes up, healthy debate and informed discussion is much more effective and productive than admonishment or brow-beating. Although I can see both sides of the handling argument, I stand firm that I see absolutely no reason for anyone to chance holding Old World species. I understand that some keepers handle their baboon and Poecilotheria species without incident, but I’ve also seen folks put their heads in crocodiles’ mouths and kiss king cobras. Just succeeding in doing something reckless and dangerous does not make it right. Furthermore, I think that folks that post videos of this type of activity are being incredibly irresponsible, as young or ill-informed keepers may be inspired to replicate this daredevil behavior. Even if you do have the world’s most docile OBT, let’s not mistakenly convince folks that this behavior is the norm and not a huge exception. I DO believe that there is some merit to the idea that a publicized bite could lead to legislation restricting their sale. I live in Connecticut where it is already illegal for pet shops and expos to sell venomous inverts including tarantulas. After a horrible chimp attack in my state in 2009, legislators put forth a bill that would have banned just about ALL exotic pets. Although this bill ultimately failed, the fact that it managed to gain any traction at all is a scary reminder that to most folks at large, exotic animals like tarantulas shouldn’t be kept as pets. Sure, we as hobbyist might recognize that these animals are harmless overall, but the general public at large is not nearly as informed as we are. As keepers, it is our responsibility to respect our animals and protect the hobby by not taking unnecessary and careless risks with them. However, whether or not handling is an “irresponsible behavior” really depends on the circumstances and the keeper. What are your thoughts on handling? Feel free to chime in through the comment section below! Special thanks the C.J. Peters for the excellent handling photos! I’m a bit different in my take on it. I only handle WHEN the tarantula wants to roam. I never pick them up. Ever. My roseas, porteris and chalcodes will occasionally climb a corner of their enclosure. I will at that point open the lid and they always waltz out onto my hand, and unlike a lot of videos, will then just plop in my palm, opisthosoma down. The porteri often will “hang 4” off the side and just veg. The arguments from the “instinct only” crowd are, in my opinion after careful observation of spiders in general all my life and tarantulas specifically in the last year or so…pure wishful bovine scatology. These critters have a wee bit more going on in their “walking dead metabolism” brains, and simple observation of behaviors over time have me convinced that while the eyesight may be very poor, these creatures aren’t like their food. They have more sense organs than you can shake a stick at, and if a tarantula will not only willingly walk onto the naked ape’s hand with NO PRODDING, and then proceed to veg out, they may not be Einstein, but they made a decision to do so. I like to think of them as the “Ents” from Lord of the Rings, where just saying ‘good morning’ might take a day or two. -heh. I’ve also been told that I might be called upon to do a little educating, and a part of that process if I decide to do it will most certainly be handling, as well as using that as an opportunity to talk about the differences, and why it isn’t always a good thing to do. —as an aside on this, the Butterfly Pavilion here in Denver has “Rosie” a G. rosea that is specifically used to let people handle in a controlled environment. A lot of the “don’t handle” crowd strikes my sensibilities as the same types who want to control aspects of your life in other areas, dragging up the same memes as the SJW crowd does. I keep some high venom species (H. maculata, P. irminia, P. cambridge to name a few), and these are my “aquarium pets”. States that ban (*cough* Maine *cough) exotics are alarmist and regulatory in the extreme. –Maine is proposing some of the most draconian restrictions in the nation, not just on T’s (which I believe are already illegal there), but smashing a ban hammer down on almost all exotic pets. A tarantula is still a “bug” to most people, and animal cruelty won’t probably ever enter the picture, as T’s are viewed as such. Banned out of fear or “control” yes…and that is most unfortunate. Hahahaha! Thanks again for the pics! I was really struggling with how to break up the text. I’ve observed some behavior in mine as well that makes me think that they might be capable of a bit more “thought” than most would suspect from a simple bug. Like you say, my little Euathlus sp. red must know that it’s crawling into my hand (especially when it just contentedly camps out). It really makes you wonder. And like you, my handling experiences have come from putting my hand out for spiders that were exploring a bit. Again, I don’t do it much because I know how it’ll end if one were to bite, but I’ve enjoyed the experience. And the common sense issue is a HUGE one in the hobby. The one part about having the blog and interacting with folks here and on YouTube is I sometimes get hit with some of the most disturbing examples of keeper idiocy you could possibly imagine. I had one guy contact me once to ask why his T suddenly died. After a couple back and forths, he finally confessed that he had thrown it at a cousin who was afraid of them, and it had hit the floor. Guess what, jackass…that’s why your spider is dead. The problem a lot of the time is that folks don’t use common sense, and that’s really where the issues with handling can manifest. And another great point about Ts being “just bugs” to most folks at large. How many times has someone told you that they’d just squish them? Drives me nuts. As always, another good article. I agree there isn’t a really good reason to handle your tarantulas for 99% of hobbyists. I do think there are people out there trying to educate and inspire people (especially children) on the plight these awesome animals face in their native habitats (habitat destruction, pollution, exportation). That being said, having a few good “animal ambassadors” certainly can help break through the “ew gross spider” rhetoric we are taught from birth. It could help inspire people to see the beauty, and power that hobbyists see everytime they interact with their pets. I could ramble on forever about how important a few good tarantulas could help remove the negative stigma so pervasive in out culture today. Thanks for another great article Tom. Thanks so much! And you bring up a great point about the educational benefits of handling. I can remember vividly being in the fourth grade when an exotic pet keeper put on a demonstration in which he handled a tarantula. I was AMAZED and immediately wanted to keep one of these animals (even despite being terrified of spiders). You are absolutely right in that seeing them calmly sitting in someone’s palm or walking nonchalantly between someone’s hands can be quite powerful in dispelling the myth that they are monsters. I know I have a couple that I purposely show folks when they come over as they are very docile non-threatening. Again, thanks for reading and for commenting! Tom….this is a fantastic take of the ongoing controversy of handling vs not handling. I appreciate your unbiased and non-judgmental assessment of the situation and I think you presented info from both camps quite well! You did not try to bolster your “side” by downplaying the other side’s position. You presented pros and cons equally without bias. I am in the handling camp. I do enjoy that interaction with what I can only call magnificent creatures. I was an arachnophobe of the worst kind but was “cured” by a wolf spider named Fobia. Fobia lived with me 2 years before succumbing to old age. I was devastated when she passed so I immediately got my first tarantula….a tiny B albo 2nd instar from Jamie. To make a long story short….I handle if the SPIDER is receptive. By receptive I mean purposely coming toward and responding to the vibrations caused by my voice, climbing out of its own accord into my hand, hanging onto my hand even though it’s feet can easily touch substrate, and being relaxed and calm in my presence. Some cleat are not and I do not handle them. As you have pointed out….docility is many times dependent on molts. My sweet Raisin….a large porteri female, suddenly turned demonic after a molt, and then back to sweet-natured again. I don’t have any OW’s because of the extreme risk involved. I have given thought to getting an E pachypus though! I would love to study human/arachnid interaction and also spider “sleep”. I know it isn’t sleep as we know it, but they do go through “profound rest” periods. Thanks again Tom for a well-written, intelligent and unbiased article! Thank you so much for reading and for the kind words. I worked on and off for over a month because I was really trying to make it as non-biased as possible. I truly feel that its not a cut and dry issue, and that folks need to really consider both sides of the argument. That is a great story about Fobia (love the name!) and your introduction to the tarantula hobby. It’s amazing how many people get into keeping spiders due to a fear of them. Although I don’t handle much at all, the times I HAVE handled have been when my Euathlus sp. red or B. albo have calmly crawled out of their enclosures into my hand. To be honest, I couldn’t resist and had to put my hand out to let them crawl onto it. Let’s just say, I can definitely appreciate why people enjoy it! And we jokingly refer to tarantula sleep as “standby mode” here. hahaha. I LOVE how they just seem to turn off sometimes. Tom, this is a wonderful article, weighted and respectful. I totally agree with the way you handle (!) this hot subject. And I’m with everything you said. Thanks a lot. First time I handled a T was some years ago. I’ve been keeping Ts for three years maybe, without attempting to handle one, when I was invited by a good friend and keeper. And he proposed me to handle his Aphonopelma chalcodes. I was totally stunned and moved by this little critter walking on my hand. And I even learnt how to do it “Stan Schultz’s way”. I must admit it was a fantastic experience, and the following night I dreamt that I was handling her again: see how it impressed me! Since, I was restless until I was able to found a chalcodes for myself (not an easy task in my country Switzerland). All this to say: I almost never handle my T, but I can understand why it’s fascinating. I dont’ know at all what it could mean for them (almost sure it doesn’t mean anything, maybe except fear), but I do know what it means for me to have such an interaction. It’s not for them, it’s for me (selfish, isn’t it?). When I interact with animals (or humans for that matter), I do it with several of my senses: sight, ears, smell… and touching too, whenever possible (obviously not with my OBT!). It’s my part of the relationship, so to say, the way I’m connecting to another living being. But as I know it doesn’t bring Ts anything good, and it can even bring problems, I almost never do it. But… ahhh… I wish I could build something similar with my Ts as I do with my cats!!!! (I know, not realistic, maybe even stupid, but hey, that’s me ;-)). Anyway, enough with my confession. Thanks again for your article, and for the other ones (older ones) too! I’m really happy to have opportunities to read this excellent blog (and your other contribution on some forum we both know). Hahahaha! LOVE the pun! Thanks so much. I really tried to be fair with this and recognize that this was a very HOT topic, so I’m glad that folks are responding to it thoughtfully and with their own takes. I know exactly what you’re saying when you say that you were “stunned and moved” when you first handled. I had a similar experience, even though I was dead-set against handling before that. It was an amazing experience for me, especially seeing I had spent so much of my life being terrified of them. It was a pretty profound experience. And, like you, I love interacting with animals, so a big part of me would definitely love for them to be a more hands-on pet. I just know that they probably don’t get anything out of it and realize that I’m risking an accident when I do handle. Thanks so much for taking the time to read this (and my other stuff! ), and for commenting. It really means a lot! First up: love your blog. Last fall I was considering giving a tarantula a home and did a ton of reading on here, which eventually led to me going to reptile shows to obtain Penny (G. porteri, about 5″) and Spark (Euathlus sp. red sling, about 1″). To say the least I have never had a moment of regret, as I absolutely love these little spiders. Alright, topic at hand; my big goal with my Ts is to make them safe, secure, healthy, and happy. On that note, I have held both spiders in the past. When I first bought Penny, one of my personal pre-requisites was that I hold her at least once, as I had just a touch of hesitation holding an animal with venomous fangs an inch from my skin. My entire family held her, and she was amazingly docile. Since that day I’ve held her once, and that’s only because she started to walk out of her enclosure. Since then, the only real prodding that I do is when I try to feed her. So I’ve got one spider that I leave alone, and one that I can’t help but hold…. in the end, I’m about 75% hands-off/25% holding is fine. I feel like the biggest thing is making sure that the spider isn’t bothered and that the handler is very well acquainted with tarantulas in general, the specific species that’s being considered, and even the individual spider if possible. Oh, and on a very amateurish note; I’d semi-contest the statement that they can’t/don’t learn. When I first brought Spark home, she crawled out of her container, put a leg on my hand, and instantly recoiled. She knew that I was something different, and didn’t want anything to do with that. Over the next week or so she’d continue to crawl out, and day by day got more and more comfortable with my hand to the point where she doesn’t even hesitate to crawl out onto me. Does this mean that she likes to be handled? Not necessarily, but I take it to mean that they can recognize us as living beings and acclimate to the idea that we don’t pose a real threat. Thanks so much for the kind words and for your excellent and very relevant story. I used to be much more anti-handling when I first got heavy into the hobby, but it’s stories like these that made me realize that it’s not a black and white issue and that many folks hold their pets responsibly and without incident. And I agree that many seem to recognize us as animals that pose no threat to them. I’ve honestly seen enough to believe that their is no way they take our hands to be substrate or branches. Again, thanks so much for chiming in! Really enjoyed your thoughtful post! I’m just now starting to get into tarantulas, having much more experience with true spiders, which I don’t handle. The only time I intentionally handled a spider was a TOTAL DISASTER. I let my Phidippus Audax crawl onto my hand. She’s always observing me with apparent curiosity, and isn’t at all skittish, so I thought it would be fine. It was, until she made one of her quick little movements. I jumped, my hand jerked, and poor little Octavia went flying. She landed okay (she’s a jumping spider, after all!) but it scared us both. Then, the fun of finding and capturing her again. All that, and all she’d done was move! Imagine what I’d do if bitten! I was about seven years old when I started reading about and obsessing over spiders. I wanted a Brachypelma Smithi more than anything in the world. It’s funny because one of the things that held me back is something you mentioned: I had formed the idea (from seeing demonstrations of “experts” handling their T’s) that handling was part and parcel of T ownership. I wasn’t keen on this, as I was afraid the spider would escape and my mother would kill me. Now, as an adult, I once again desired to get into tarantulas. And I was SO RELIEVED when I learned that handling is not only unnecessary, but that many experienced T owners recommend not doing it. It’s not that I’m afraid to handle, it’s just that I know that tarantulas are more fragile than my Audax, and the aforementioned bad experience taught me that even though I’m not afraid of spiders and I’m a pretty calm and reasonable person, reflexes are reflexes, and mine are pretty jumpy. I’m not going to fool myself into thinking I can control that. For a few weeks now I have been the proud keeper of a B. albopilosum sling that I am completely enamoured of. She’s only 1 1/2″, but she’s extremely docile and not skittish at all, which seems unusual for slings from my research. Still, I’ve only handled her once, and that was a complete accident. When I was unpacking her, she crawled out onto my hand and refused to go into the enclosure (my hands were warm, so I think she liked that). I let her hang out on my hand while I took some pictures, then succeeded in coaxing her off. I haven’t handled her since, and I don’t really plan on it. I like your fish analogy, because I used to be really into keeping betta fish, and to me it’s the same thing. Obviously I never thought of handling those. They’re purely for observation. T’s (and really inverts in general) are fun to watch, feed, and set up enclosures for. If you want more than that, get a reptile or a mammal. Fantastic reply…thank you! I think there are many people that get into the hobby who think that you are SUPPOSED to handle tarantulas…and that if you don’t, you’re not a true hobbyist. I’ve had many folks contact me to say they were embarrassed that they didn’t handle, or that they were trying to get over their fear to handle. The truth is, a good majority of serious hobbyists NEVER handle. It’s not a major part of the hobby for a lot of people, especially those who keep the fast-and-feisty Old World species. I’m like you in that I know I’ll flick my hand if bit and probably launch my spider. It’s just how I react. I, therefore, don’t want to put my Ts in any unnecessary danger by risking it. I have three B. albopilosums myself; they are an awesome species. I do hope that you get your B. smithi soon! Typically, in cases I was forced to handle namely because my versicolor sling was walking up my hand or paintbrush during feeding etc. I solved the problem by putting it into a larger enclosure where both of us could work and not get into each other’s way. My Klugi is pretty calm, but a paintbrush and container are my best friends. If my hand does get close to the T, it flattens down to the ground or runs away. They’re look but don’t touch pets, unless there is a grave crisis at hand IMHO.